NovaBirds Cam Blog: Scram is home for the holidays! The snow has melted off, and it seems to have brought back a familiar tail! After yet another hiatus, Scram has returned yet again, just in time for Christmas! 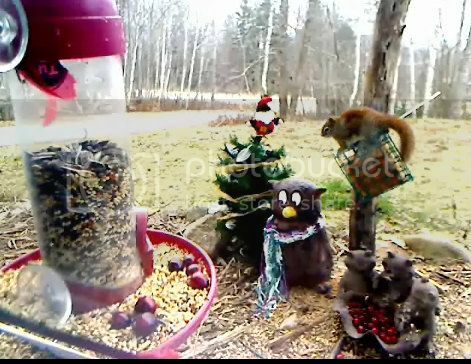 It was a very nice surprise to see him show up to have a snack on a Bird Pie in the suet block. I hope he sticks around a while! Pesky or not, he's a nice visitor to the cam!